Ranchi, March 28 : Former Bihar Chief Minister and Rashtriya Janata Dal (RJD) chief Lalu Prasad, who is behind bars following his conviction in four fodder scam cases, on Wednesday left for AIIMS in New Delhi for treatment. Lalu Prasad left for the national capital by the Rajdhani Express in the evening. A special CBI court had on Tuesday given approval to take the RJD chief to AIIMS for treatment. It granted the permission based on reports by two medical teams. Hundreds of RJD workers gathered at the Ranchi Railway Station to see off the former Bihar Chief Minister. 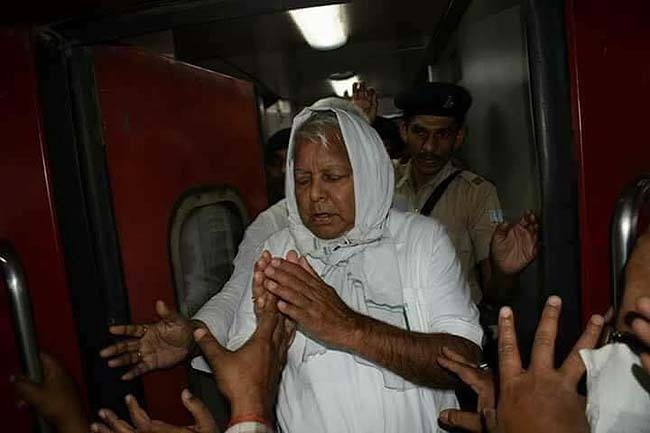 As he was brought to the station under heavy security, slogans like "Jail ka phatak tootega, Lalu chootega (Gate of jail will be broken and Lalu Prasad will walk free)" were chanted by the supporters. 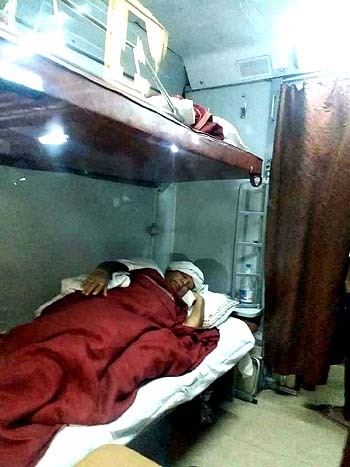 Three party leaders accompanied him in the train. A medical board was constituted last week in the local Rajendra Institute of Medical Sciences (RIMS), where Lalu Prasad was shifted from jail on March 17 after he complained of chest pain and discomfort. The medical board recommended that Lalu Prasad be shifted to a higher medical centre as he has multiple health-related issues which needed better care and monitoring. A second medical board on Monday recommended to send him to AIIMS. Lalu Yadav has been in the Ranchi jail since December 23 last year when he was convicted by a special CBI court for fraudulent withdrawal from the Deoghar treasury and was subsequently awarded three-and-a-half years' of imprisonment on January 6 this year. On January 24, he was awarded five years of imprisonment in the Chaibasa treasury case, while on March 24 he was awarded 14 years of imprisonment and a fine of Rs 60 lakh in the Dumka treasury case. The RJD supremo was convicted in the first fodder scam case in 2013 and awarded five years in jail. The court had charged the RJD chief with fraudulent withdrawal of Rs 47 lakh from the treasuries in Banka and Bhagalpur districts. But later, he was granted bail.